wave 'em around like you just don't care! Friend #1: Rob is redeemed–look how high off the ground he’s jumping. Friend #2: Umm…can you imagine Rob as they were instructing him what to do? Friend #2: He is probably smoking in that picture where his face is obstructed. Friend #1: he was shiizzzzzing himself. Friend #2: That’s why they picked that pic. They couldn’t let the ciggy show. Friend #1: have you seen the harry potter special features where he talks about having to dance at the ball? he HATES dancing. but dude did this…he knew he better. She’s right! The mattress mambo IS a ‘sort-of’ dance. And I bet you’re the Mambo-King! Thanks, as always, to the fab four (I am in the fab four, so I just thanked myself), Robsessed for the HQ pics and JBell for the caption on the first pic! Moon & I call discussions like the one we’re about to have: “breaking it down vanity fair style” b/c we started the blog after breaking down the vanity fair vid (the 1 hour one) like it was a work of art (it was). Friend #2: that’s my fave kiss in the movie… the first one was hot, but NOT edward and bellaish. prom was totally edward and bellish. Moon: which one shall we start with? How about the slow .gif? Friend #2: too slow for me… i am not a fan of extended foreplay. Friend #2: nope…not a fan of that either. i’m like a man. Moon: can we talk about how much of a dead fish kristen is?? Friend #2: she is a COLD dead fish. Friend #2: he looks PAINED…exactly as edward should look at this point in the relationship. NOT jumping onto her bed with her. Friend #2: YES! like Edward. UC: i can’t stop watching. does she not realize who she’s kissing? Friend #2: um…i love me some Oregano in Almost Famous…but he ain’t got it going on as an adult. Moon: ok should we move to the fast .gif? Friend #2: dude, that’s the only one i’ve been watching. no slow. no slow-mo. EVER. Friend #1: can I just say…BEST PART OF THE MOVIE!? 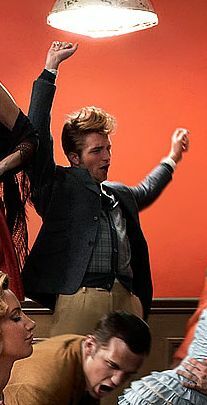 Rob should never take that suit off…. Friend #2: i wouldn’t be jealous at all…but i would expect a play by play… the full deets. Friend #2: i’m here. i’m dying. Friend #1: No I am here…I just thought I should let you two have your argument in private. UC: i just got distracted b/c i got an email that said “Kristen Stewart is following you on twitter. i KNEW she read our site! Sources: Robsessed & Commenter in the Robsessed Post and it turns out our reader, KD, MADE the slow gif. Please bow in her presence. You’ve entered our Twilight-Party Pack give-away contest, right? If you haven’t, go to the post NOW and tell us a song that makes you think of Twilight! You have until Tuesday to enter! Seriously.. it’s that simple. We love giving you free shizz. Go there now!